This cute Orca Whale picture is taken right outside of Telegraph Cove off Northern Vancouver Island in British Columbia Canada. One of those magic whale watching moments, two Orca Whales are spyhopping and kissing just outside of Telegraph Cove off Northern Vancouver Island in British Columbia, Canada. On this day the whale watching tours from Telegraph Cove hardly had to pull off the dock. About 30 whales were playing outside the bay. 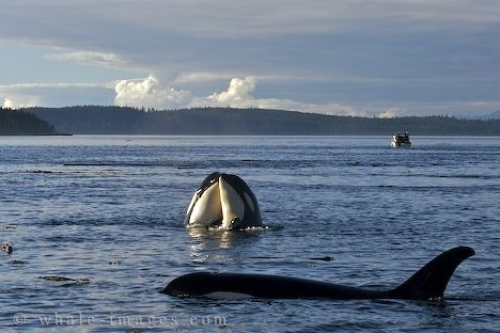 This photo shows members of a family pod of the northern resident Orca Whales. Telegraph Cove is well known worldwide as one of the best whale watching spots in Canada and British Columbia. The whale watching boat M.V. Gikumi was the first whale watching vessel along the British Columbia coast and is still available for daily tours to see the orca whales of Johnstone Strait. Here is a great selection of photos on the topic whale watching in Canada.